Through the centuries, scientists have found innovative ways to harness the power of the sun — from magnifying glasses to steam engines. Converting more solar power into electricity is high on the political agenda in many countries, amid the push to find domestic energy sources that are less polluting than fossil fuels. Solar is growing quickly in the United States. 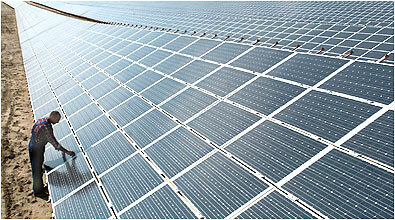 According to the Solar Energy Industries Association, more solar was installed in the third quarter of 2011 than in all of 2009 combined. Assisted by technological innovation and years of government subsidies, the cost of solar power — and wind power — has fallen sharply, so much so that the two industries say that they can sometimes deliver cleaner electricity at prices competitive with power made from fossil fuels. At the same time, solar and wind power companies are telling Congress that they cannot be truly competitive and keep creating jobs without a few more years of government support. The growth of solar power was helped by a federal stimulus package that extended a tax credit and provided other investment incentives for the industry. A one-year extension of the 1603 tax-grant program would create an additional 37,000 solar industry jobs in 2012, according to a report by EuPD Research. But the lobbying by the wind and solar industries comes at a time when there is little enthusiasm for alternative-energy subsidies in Washington. Overall concerns about the deficit are making lawmakers more skeptical about any new tax breaks for business in general. And taxpayer losses of more than half a billion dollars on Solyndra, a bankrupt maker of solar modules that defaulted on a federal loan, has tarnished the image of renewable power in particular. Solyndra was financed under a now-expired program, part of the 2009 stimulus package, that provided government loan guarantees for clean-energy projects, some of which administration officials expected to be risky. But solar and wind companies argue that the tax breaks they are seeking are different. The tax credits can be taken only by businesses that are already up and running, so taxpayers are less likely to be stuck subsidizing a failing company, proponents say. Without the new breaks, industry executives warn, they will be forced to scale back production and eliminate jobs in a still-weak economy. President Obama, who has been a steadfast supporter of clean-energy programs, has already begun making a case for new government investment in clean energy projects as a way to foster both energy independence and employment at a time when Capitol Hill evaluates new laws in terms of job creation as well as budget cost or savings. Article shared from the New York Times, click here to read more.